In 1888, H. D. Watson established the historic Watson Ranch, at one time containing 8,000 acres, reaching from the fertile Platte Valley on the south to the rolling hills on the north and from downtown Kearney to a point five miles west. During its existence, the ranching operations were devoted to grains, poultry, vegetables, and a 250-acre fruit orchard primarily of cherry, plum, and apple trees. Watson planted thousands of other trees of numerous varieties. 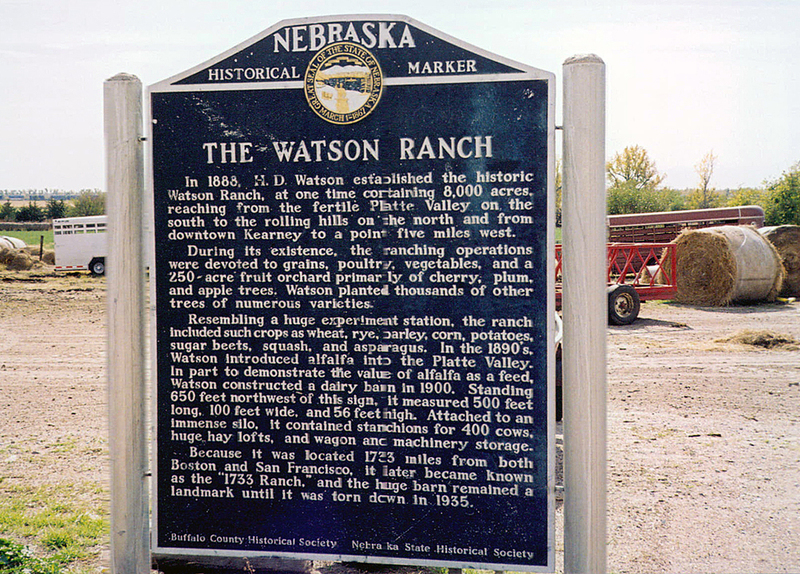 “Watson Ranch,” Explore Nebraska History, accessed April 18, 2019, https://mynehistory.com/items/show/36.